I have been baking for the past 6 years now, but this is the first time that I baked myself a cake for my birthday. 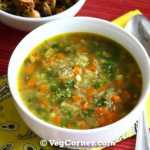 I had a couple of recipes in my list but this one caught my attention. 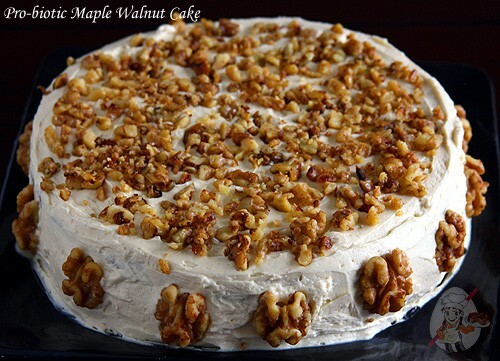 Maple walnut is our favorite ice cream flavor, so when I saw a recipe for maple walnut cake I was very excited to try it. I made a couple of changes to make it lower in fat but the cake still tasted very RICH. Initially I wanted to try the best combination of egg substitute that I always rely which has worked wonders in this blueberry pound cake, strawberry cream cake and pineapple cake. But I was out of luck and was not able to find silken tofu at all. So I decided to go with just yogurt. Then had another idea and used kefir instead. The cake turned out decadent and delicious. Compliments kept pouring from everybody who tasted the cake. 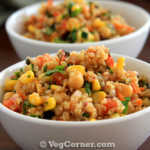 So do try this interesting flavor for your next special occasion. Bye, bye vanilla and chocolate cakes! Welcome this new and amazing flavor combo of maple and walnut. 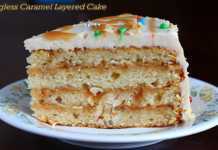 This truly decadent eggless cake will make any special occasion a super special one. Heat butter in a pan and fry the walnuts until it’s roasted, for about 5 minutes. Stir in the maple syrup and salt; cook for 1 more minute. Spread on a baking sheet to cool completely. Preheat oven to 350F/180C for 15 minutes. Line two 8 or 9 inch round cake pans with parchment paper. In a medium size bowl sift together the flour, baking powder, baking soda and salt; set aside. In a large bowl cream together the butter and sugar until light and creamy. Beat in the maple syrup, kefir and maple extract too. Add the flour mix to the creamed sugar mixture alternately with milk, beating after each addition. Stir in 1/2 cup of candied walnuts to the cake batter. Divide the batter among the 2 pans (approx. 2 and 1/2 cups of batter per pan) and bake it for 15-20 minutes or until a toothpick inserted in the center of the cake comes out clean. Cool in pan for 10 minutes before moving to wire racks. Cool completely before frosting. Combine 1/4 cup sugar and 1/2 cup water and bring to boil for about 3 minutes. Let cool. 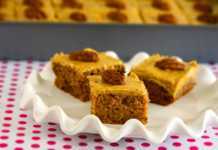 Once the cakes have cooled enough, poke holes with wooden skewers and brush the cake with the sugar syrup generously. In a large bowl beat butter until creamy. 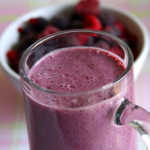 Beat in the sugar, 2 tablespoons of syrup, 2 tablespoons of milk, maple extract and salt to reach the desired consistency. Place one layer on a serving plate. Spread with 1 cup of frosting. 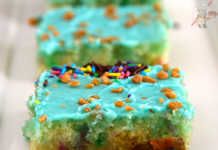 Sprinkle 1/2 cup of candied nuts over the frosting and drizzle a tablespoon of maple syrup. Top it with the 2nd layer and frost the top and sides of the cake. 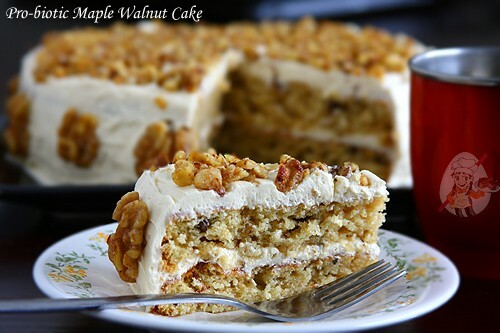 Sprinkle the remaining 1/2 cup of walnuts ont he top of the cake and drizzle another tablespoon of maple syrup on top. Hi,can we substitute maple syrup extract with vanilla extract? 1/4 cup of silken tofu and 1/4 cup kefir/yogurt. Excellent recipe. Can’t wait to try it out. What kind of kefir do you use? I see there are different kinds like grains, milk kefir and water kefir? Do you get equally good results with yogurt? 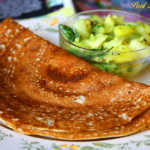 I used milk kefir, Indira. But yogurt should definitely work too. Can use this recipe for the cupcakes? Yes it should work out Kugi. If I dont have Kefir, what can i replace it with and how much qty ? You can use plain yogurt instead. Wooow cake looks really awsome… Thanks for making my job easy as our 10 Anniversary is nearing and wanted to bake something really special.. This looks perfect… My only question is, what is kefir and any substitutes can be done in what measurement? ?